More than 700 people were killed in a stampede during the Hajj pilgrimage of 2015, which took place just a few days ago. There have also been stampedes during religious events in India that have cost us hundreds of lives. So pin-pointing the causes of death and injury in stampedes, and devising methods of prevention is of great importance to a large number of people. However, we had not been able to explain how people could die on flat ground. In this article, we present a model for how forces on people in a crowd of flat ground can increase to such a magnitude that people would be crushed to death. We also present a number of mechanisms for preventing deaths due to excess pressure in crowds. On flat ground, as long as everyone in the crowd remains standing and stationary, there would be no horizontal crushing force. However, a person can generate a force by trying to move in any direction. Let’s say one person can generate 10 Kilograms of lateral force. Now, if ten people stood one behind the other, in contact with each other, and pushed in the same direction, they could be expected to generate approximately ten times the 10 Kg of lateral force. 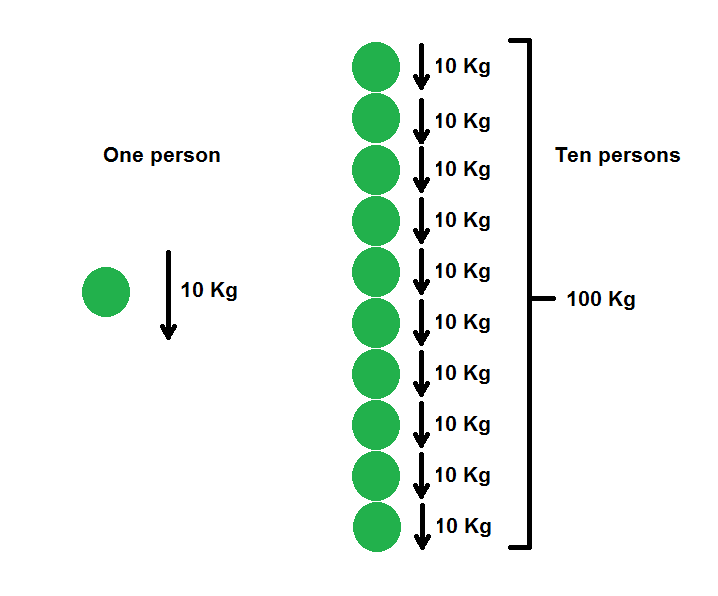 In other words, they’d be exerting 100 Kg of force on anything ahead of them, as shown in the figure below. When people in a crowd experience such accumulated forces, they are either injured physically or asphyxiated. Autopsies of victims of asphyxiation in stampedes showed that they could have experienced pressures on their chests of around 6.4 psi. If the area of the torso coming in contact with another person in a crush is 2 square feet, about 1 ton of force (about 1000 Kg) would be needed to exert a force of 6.4 psi. A tightly packed column of 100 people could generate that kind of cumulative lateral crushing force. So, if a tightly packed column of people say a 100 men/women deep were to suddenly be obstructed, say by a barrier or by another group of people crossing their path, the forces experienced by those in front (or at the intersection) could be as high as 1 ton. This seems to have been what happened in Mecca a few days ago. “As our group started to head back, taking Road 204, another group, coming from Road 206, crossed our way,” said another worshipper, Ahmed Mohammed Amer. On January 12, as we were returning to Mina for the last ritual of Haj, we saw the big stampede from a distance as waves of people collided. I will now attempt to show that in a constrained space, even higher forces can be generated by a wedging effect. A wedge is a mechanical device that can amplify forces. 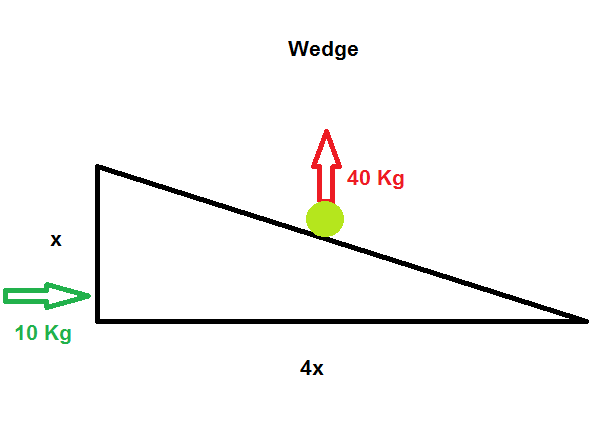 If a wedge that is four times as long as it is tall is used, and a force of 10 Kg applied along its longer edge, it can generate a force of 40 Kg in the direction of the shorter edge, as shown in the following diagram. Restraints of any kind (railings, barriers, fences, chains) can act as wedges and increase the pressure within a crowd perpendicular to the direction of movement of the crowd. 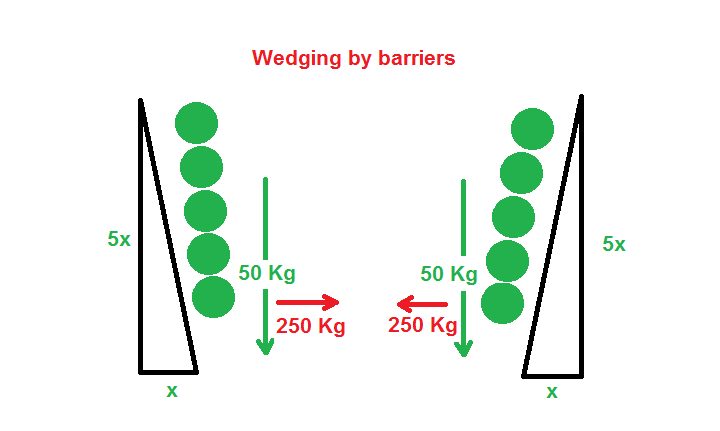 So, a column of 20 people can generate a force of one ton if they were wedged in between fences of an aspect ratio of 1:5 (the fence closed in by 1 meter for every 5 meters of road), as shown in the following diagram (for space, we have demonstrated that a column of 5 people can generate a lateral force of 250 Kg on account of the wedging). 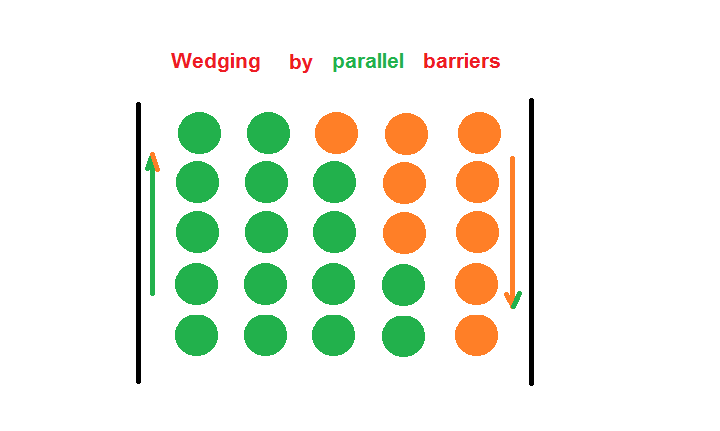 Wedging could also occur if the path had no constrictions, if people in the crowd moved in opposite directions, as shown in the following figure. The above kind of wedging is probably what caused the deaths at a Love Parade in a crowd that had been standing still. Organizers could close off all intersections, and keeping all movement going along completely parallel, non-intersecting channels. This would ensure that there could be no obstructions to movement. Organizers would need to ensure that routes never constrict. So, gates and converging roads would need to be avoided. Also all traffic would have to be one-way. This would prevent the formation of wedges.